The second annual Colleges of Science and Engineering Joint Annual Meeting (COSE-JAM) for graduate students and postdoctoral fellows will be held Friday, December 7, 2018 in Jordan Hall of Science. COSE-JAM aims to highlight the achievements of postgraduate trainees, foster interdisciplinary research and interactions, develop presentation and mentoring skills, furnish advice on career development, and provide a forum for extramural scientific and job presentations to diverse audiences. 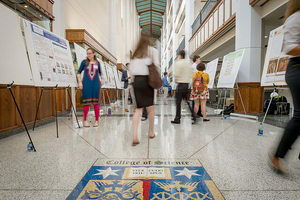 This all-day event consists of morning podium presentations, a lunchtime Q&A session with the Associate Director of the Office of Postdoctoral Scholars as well as multiple directors of graduate studies from both colleges, followed by an afternoon poster session and concurrent social reception. All graduate students and postdoctoral fellows at the University of Notre Dame and Indiana University School of Medicine-South Bend are invited to participate in COSE-JAM by sharing their original research with their colleagues in either an oral or poster format. Research may have been conducted on or off campus, and mentored by faculty from the University of Notre Dame and/or at other universities and colleges. Please note that the costs of poster printing will be covered by the COS and COE. Abstracts of 300 words or less are due no later than November 29, 2018, through the submission portal. Direct all inquiries to Matthew J. Ravosa, professor of biological sciences.